Awesome, Purg! It was thanks to the post you made in a comment on Rênes de l'hippogriffe oublié depuis longtemps that I was finally able to get all five crystals a couple of days after I had to give up on that 4-out-of-5 night. Well done! Awesome guide! I used the Paste//TomTom coords method and got my mount! If you're the winner, the Hippogriffe oublié depuis longtemps will spawn hovering in front of you and casts Cyclone arcanique on you for some reason, but it doesn't actually do anything. A quirk for me is that the mount did not appear in my bags, but only because I didn't realize they were full. No need to panic, however! As with other items, Thaumaturge Vashreen will mail it to you as a lost item. One final thing is that I had to take a break after my fourth crystal, due to some motion sickness starting to kick in after a very long search for the fifth and not having found it. I let my character /AFK logout to the character menu, then logged back in from there once I was good to go. And after 2 hours of searching them over and over, found my 5th in a new spot which Thank God I moused over. I'm confused regarding point 50, 77 (Isle of the Watchers). You say it is "in cave in broken ship". Yet I can't find a cave inside a broken ship or a broken ship inside of a cave. I found a cave at 51, 75.86, but there's no broken ship and it is small. now can i still see the crystals later since i got it ? like if i wanted to help a friend ? I just started my journey today on our low pop server - and I got my Hippogryph after just 5 crystals? O_o Took me about 20 minutes with your very nice waypoints, so thanks for that! Just wondering if the perquisites have been changed to 5 crystals instead of 8... or if I was the victim of a rather fortunate bug or something. Got mine today! I'd gone out looking several times without finding any crystals, and decided to wait for flying - which definitely makes it easier. I used the paste add-on and tom-tom, which worked well - but I'll point out that I did NOT go inside the big cave (something cove, with the giants and slaves) until I had actually found a crystal elsewhere. Obviously, if there are 5 up, there will be some elsewhere. Sure enough, once I DID find a crystal, I went inside that cave (and forgot, at first, that I could go in cat mode and prowl lol) and found one of my 5 in there. So I've tried to find any information on this without luck. At around 19:40 ST on Bladefist I clicked my first crystal. Out of sheer luck I found the next 3 pretty fast. At some point after clicking my 4th crystal I circled back to one of the previous crystals only to see that it had despawned, I did a lap and discovered that all 4 had despawned. At first I thought someone had found the mount after I clicked my 4th, which was around 20:40 ST. So I went through the chat log only to find out that there had not been a serverwide emote as should be. Is it possible that there's a timer on how long anyone has? Do the crystals despawn after a certain amount of time if no one managed to find 5? Was trying to help a guild member with a coordinate when I realized I couldn't find the spot it describes. This needs to be confirmed by someone with flying. By the way people, if it's in a cave or otherwise underground you need to describe (slapping tabletop each time with open hand) HOW. TO GET. INTO. IT., because getting to it above ground is completely f3@%ing useless. What the hell are you supposed to do, dig downwards? Thank you very much for the great guide. Just found mine! I'm not so sure about "only one crystal spawning at a time". I got my hippogryph today and started searching for the crystals in the north-western corner as I noticed one during a world quest. I just searched the spots systematically and had searched only about a half of the map before finding the fifth one, without backtracking. Thanks for the great guide. I managed to get the hippogryph yesterday, after several unsuccessful attempts. I credit at least some of my success to the fact that it was class mount day and most people were focussed on that task. I found the first crystal while I was on the PvP quest "Operation Murloc Freedom". It was near the shoreline, but still within the PvP zone. Found the last one at approximately 57,31 at the foot of the statue in the Greenway, surrounded by Eternal Guardian mobs. Not sure if this location is marked on the map, however. In the end, finding the five crystals took approximately 30 minutes and all crystals were out in the open (none in caves). Thank you for outlining all the waypoints, my only complaint would be that if you are copying and pasting them into macros, all the stuff next to the points has to be deleted and it slows you down a lot. However, thank you for compiling, I hope to have my mount soon. You may care to download my Long Forgotten Hippogryph AddOn from Curse or WoW Interface. It is in the style of my well-known Netherwing Eggs AddOn and is tailored specifically for the task. Notably it correctly differentiates between Oceanus Cove / Cave / outdoor locations. There is information around which suggests that all caves have crystals. Many do but only a quarter of the total do. The AddOn documents almost 40 cave entrances for you to explore. Don't forget: If all five crystal locations have already been revealed then only one thorough sweep should be sufficient. Just be darned quick about it! The other situation is when you are freshly discovering the locations. In this scenario, as soon as you have found a crystal you should consider the map as "fresh" and needing to be totally explored, including that part of the map already traversed. Don't forget: A "set" route would be nice but the practical reality of having to run away from mobs and other players on PvP servers makes a fixed route impractical. I find that on occasion when I must jump off a cliff, for example, I am redoing an area already traversed. That is actually okay if you are still revealing the crystal locations and there are other players also hunting. The key is to continually move. Never stop. When you are not moving you are not discovering and you are more likely to finish up dead. Minimise repeating areas for sure, but constantly moving is the key. Help! --> Found a location I did not document OR which I stated was not verified? Please take the time to send a screen shot to my Curse or WoW Interface page. Please ensure the screenshot is such that it allows me to go there myself and stand directly upon where the crystal should be. Rough co-ordinates would be nice too. (Yes, I know that with my Netherwing Eggs AddOn I insist upon actually discovering / witnessing the egg myself but with this one I have to be more realistic, at the cost of being out by a 100th of a coordinate point or two). Edit: About a week ago I tweaked the AddOn a bit, based largely upon player reports. I still stand by my opinion that as it is PURPOSE MADE it does a better job than the others. Plus much more accurate in locations too. Edit: Please take note of the comments at the foot of Purgatorywolf's Guide about locations and screenshots. Many well meaning people have contributed over time but sadly definitive and accurate reports are hard to come by. This particular mount grind is proving, even now, to be rather hard to get exactly right! I admit to being a very tough judge so you may find a location or two in Purgatorywolf's list above which I have not included. I keenly await definitive reports! Just got mine of Medivh/Exodar at 1:50pm EST. First time trying. Guess the small server size allowed me to be pretty much unhindered. Incredibly easy if you download the addon Long Forgotten Hippogryph, NOT the HandyNotes extension. This AddOn has almost all of the latest waypoints for each crystal. I downloaded this addon and flew to each point, obtained my mount in less than an hour on US-Ravenholdt at 10:04pm EST. Good luck! I was too lazy to grab the addon, but on Duskwood I referenced this guide for locations and managed to find 5 crystals in just over 2 hours. Thank you for the list. I am surprised that I managed to get this mount, but maybe it was a quiet Friday on this server. After 3 hours searching I found my 5th crystal inside a cave at /way 57/26. I believe thi coord is new because i was i using the waypoints on this guide. I hope this help you guys. For those flying around my advice: Get. inside. the. caves. Don't know how to upload screenshots here yet but i guarantee i found my 5th on this location. I have run these coordinates 3 times. I found 4/5 all from here. The 5th was nowhere to be found. Can you please tell me if for example the first respawn earlier than the 5th? In other words, if they have different respawn timers. Found my last one around 57,15. It seems the spawns are random in an area rather than a specific place. Are you sure it displays "You hear a faint call in the distance and then silence" to the entire zone? I'm on UK/EU - Argent Dawn server and I've seen the crystals 3 times now. The first time there were literally two crystals right next to each other and after flying around looking for some I eventually flew back around and the crystals were gone - there was no message displaying that but someone did get it. Second time I was the one that got the mount, the message appeared for me when I got the reins but I was soloing so couldn't really ask anyone if they saw the message. Third time was today I was farming plants and saw one again, I stood next to it for a while and flew around getting herbs in Azuna, an hour or so later the crystal was gone and again there was no message. I'm not sure if it applies for others but found it a bit odd? If you pick up the Kirin Tor Mana saber quest in Azuna, it looks like the world is "spawned just for you", including the crystals, so pick up the quest and go hunt crystals insted of energy, and you end up with a hippo insted of quest reward. Or at least so it looks for me. it worked for me and a friend so far. Can anyone else try this and confirm if it works ? Thank you so much for this guide! I finally got the mount today after 2 failed attemps. Took me 2h30 on Argent Dawn. Thanks for this guide. Got mah birdy in like an hour after randomly finding a crystal, and hurrying to get to this guide for the waypoints. I hunt for these Crystals everyday. Most of the time to give it away to whoever DMs me first on the Secret Finding Discord, sometimes to my guildies or friends. I have a ton of Screeshots of the locations I have found them at so far. Have been uploading a lot of them to the Ephemeral Crystal page. a few got accepted already. However my PC is a toaster, but I try to take the Screenshots at the highest graphics options it can handle. The SS's on the crystals' page have their exact coordinates locations, except for the ones inside caves, those I give the cave's entrance locations. I have a habit of checking 10-20 spots while doing WQs and found my first crystal yesterday. Within about an 90 mins I found 4/5. Could not find the 5th. Then my wife (with child) came home. And demanded I log off to do chores and family time. I delayed best I could but...you know, marriage. Crestfallen, I knew it wasn't going to be some time before I could log in again. More than 8 hours later I logged in and lo and behold the crystals were still there! I'm in a low pop server. The crystals were clickable for me again, so I thought what the hell, let's go find the 5th. It took over an hour to find it, but I did! And when I clicked it... nothing happened. I was SOL. I was about to offer the locations to a friend but then I had the thought to go get my alt and see if it worked for them. I logged in with my alt and went back to the first crystal location where I found 6 or so players gathered around it. @#$@. I knew I had a race on my hands so I booked it to the other 4. I clicked the last crystal and got the mount. So lesson to be learned - you can use alts to get the mount if somehow more than 8 hours pass from first click and the crystals are still up. This is likely to be pretty relevant post Legion. some coords are a bit off, or not disappearing on reaching the point! beware! Do the crystals spawn at set locations on each server, or do they spawn at random locations each time they refresh? Damn it the spawn spot under the lake in el'dranil shallows! I gave away 7 mounts by now (or so) plus got one myself and occasionally found some more which I couldn't find anyone to give them to and either despawned or someone else got them while I was off and after 4 crystals I just could never find 5th, so went back to check here to learn of new spawn spots and I found it was there, hardest spawn spot so far for me, even when I already knew of the other underwater spawn spot! https://imgur.com/Kcm5fPN is the screenshot that is already linked in the page that let me find it. Edit: apparently I was wrong, leyhollow cave one is definitely harder than this, that is hard to see even if you look at it, unlike underwater spots! This went surprisingly quickly. Found 5 crystals in the center-SE areas of Azuna, SE of Azurewing Repose. Two in caves, three pretty much out in the open. Took about 1-1/2 hr. I did circle the island 2-3 times but in my case all the crystal action was south of the mountains. I don't know if this has been nerfed or I just waited long enough and picked a dead enough night (which is what I usually do when farming something). I rarely do much of anything grindy so I had low expectations and was pleasantly surprised. Anyway, if you're still looking, hope it goes quickly for you too! Got my birdy in an hour or so when I spotted the first crystal. Used addon to show the spawnpoints and just zigzagged around and last run went only the caves where the last needed one was.She is a Lady <3 Definitely fitting mount for a night elf druid or almost any class that night elf can play. So you just fly around randomly and hope you can find 5 before anyone else does? Pffft F that. I dont want to spend hours just flying around searching for something that half a million others are looking for as well. Total waste of time. So you have to RESTART every time it respawns? I got 4 out of 5 and then there was the "caw of defeat". So now I have to restart it? Thank you so much! This guide with all the coords helped me eventually capture that elusive beast. Today was my lucky day. I go to Aszuna to complete some alchemy quest on an alt only to discover a crystal right next to the object i need to loot. This sent me on a frantic rat race where I got 4 in a hour. I spent the next two hoping against hope and thanjfully the RNG gods blessed me and I found that 5th crystal. Great guide and kudos to you for all the hard work you put into this. I had just found my 4th crystal, I was so excited and then I watched someone walk into the cave I was just in and click the crystal I just clicked. He gets the mount. I was devastated, tried again about 4 hours later. Found 3 crystals right away but couldn't click them. Found a 4th and it was the one I needed for my mount. So you CAN log off and just wait for them to respawn. Your debuff from earlier crystals will still be around so you might see some crystals up but can't click them. My advice, use a trial 100 druid on a low pop server. Long forgotten hippograph is the way to go as far as addons are concerned. I was using handynotes version but it was missing a lot of the crystals on the map. I can CONFIRM - saw the "you hear a faint caw" text at approx 1230am on 4/26/18. Ephemeral Crystals were up by 1:00pm 4/26/18. The 12 hour respawn timer on crystals is likely a correct assumption. I had 4, and was beaten by someone else. For the record, the Long-Forgotten Hippogryph Add-on was invaluable. Thank you very, very much to the author. Between 8:30am and 9:00am local time (5:30am - 6:00am server), I successfully found 5 crystals. Competion at this time of morning was absolutely nil. It took no more than 25 minutes of searching. I am fortunate in that I work from home, so after I got my kiddo on the bus, I logged in before I started working and got the stones with relative ease. Again, the add-on was an amazing help, and my thanks both to the author AND the community for contributing to it. This is something most of us should be able to do without any major difficulty because of it. Go Off-Peak - I experienced no competition at all at the time stated above. This occurred on Cenarion Circle, which is a very low-pop realm on a Friday morning. As such my luck may not be the same on high pop servers. I last saw the "you hear a faint caw" message yesterday at about 4:45pm local time. It was likely sheer luck that I was able to find stones without competition 16 hours after that time. Server time/local time plays a huge factor. Look for Aberrant NPC Behavior - the primary reason why I found the last stone so easily was because the bears that normally sleep around the rocks were acting strange. They were chasing each other in circles around the rocks, and that behavior immediately abated when I clicked on the final stone. I also noticed that the spirits around Nor'Danil Wellspring were also acting strange. The few spirits that were near the stone when I found it were in the process of channeling a summoning spell (visual effect only), a behavior I haven't noticed from them at other times. A question to the author: I used to be able to go to screenshots to learn new spawn spots, imgur is still working for me in general, but it gives me an error 403 with every single spawn spot screen here, is it something you've changed recently, considering the screenshot I posted here in a comment is still working correctly? Anything I should do if not, to make it work? Edit: very weird behaviour actually, if I open the links directly they don't work, but if I copy the not-working-link once it "opened" and paste it, even without opening a new page it works, and the same problem happens on 2 different browsers, same behaviour. 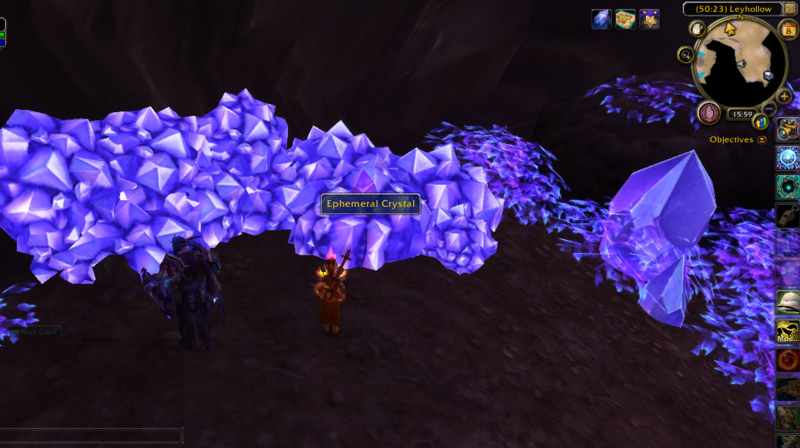 Nice guide, I used the AddOn Long Forgotten Hyppogryph to track all the Ephemeral Crystals. Flying through Azsuna to complete my Emissary Quests for Court of Farondis, in the afternoon of last day at the Brazilian server Nemesis, I saw that message when someone gets the mount, it was 04:53 PM to be exact. I used the picture of this guide as "start" point and since the AddOn have the same cords, I looked for them clockwise. Really wanted this lovely Hyppogryph for a while and I'm really grateful for you guys hard work. I used the AddOn Long Forgotten Hyppogryph to track all the Ephemeral Crystals. Flying through Azsuna to complete my Emissary Quests for Court of Farondis, in the afternoon of last day (09/05/2018) at Brazilian server Nemesis, I saw the message "You hear a faint caw in the distance and then silence...", it was 04:53 PM to be exact. Based on this guide, I waited 12 hours for it and 04:53 AM (day 10/05/2018), I started looking for them clockwisely, using the picture of this guide as a "start" point since the AddOn have the same cords. I found the first crystal right next to the Illidari Stand flight (45.40, 45.36) really close to the tree, I don't remember the other 3 cords because I was really excited and anxious to see if I would find more and 05:11 AM of the same day that's when I found the last one right next to a big tree at 54.39, 26.00. It took me less than 20 minutes to find all 5 crystals! I have used only HandyNotes to get the crystals, but i wish i didn't do that from the beginning, so i decided to give this guide a try, already had the Paste addon so i copied and pasted. Apparently, HandyNotes is missing a lot of spots, i would always get stuck at 4 crystal not being able to find the 5th sadly. Thanks to the author of this guide, i got my 5th which it wasn't marked by HandyNotes. I highly recommend getting the Paste addon and copying/pasting the locations given here.Thank you Purgatorywolf. The addon is perfect. Today at around 2 Am in Defias brotherhood realm started searching for crystals and after 30 mins around 2:30 Am got the mount. well time to get some sleep now. 1) Go on your druid. Pops in & out of flight form faster, and can stealth past mobs to check out caves easily. 2) Go inside the caves, don't just move around your camera from the outside. My last crystal was inside an alcove inside a cave, and I didn't even know that cave had alcoves. Completed this easily today on Bloodscalp. I used Paste and TomTom and just went in order. I don't know exact duration but it took less than an hour. Got all 5 in just under 20 minutes. 4:00am right before reset. I just completed this at 1:53 PST after starting it around 1am. I used the handynotes addon to get an idea where to look, then just expanded the area around each marker. I ended up finding one crystal that wasnt indicated on the addon. /way 51 / 65 (where i completed the challenge). What is crazy is I was looking over the guide of things to try to complete before 8.0 is out, read about this mount, clicked this guide and started looking around 12:50am PST. The 1 difference I noticed is that no buff/debuff indication was visible. Only the fact, that there is a clickable crystal -> crystal becomes unclickable after using. Hey Taraezor! Your addon Long Forgotten Hippogryph is not compatible/updated with current patch 8.01 and NONE of your commands listed in addon information box like "/lfh" or /hippogryph", or "/lfh m" work. PLEASE FIX THIS ! :D a link to your FAQ also doesnt work. handy notes lfh addon is up to date and works but does not have near as many spots to check/descriptions as of 08/28/18 1350 EST. idk how else to get a hold of you! Today, I lost one of the mounts by only one crystal. After that I remembered the phasing issues between war mode on and off and gave it a try by changing my war mode (I used another character). Then, when I checked, there were available crystals and now I have a pink cute mount! Thank you, got the mount after multiple tries before. Started at 03:00 am wedenessay morning in 20 mins. Thank you so much for the way point list, I also highly recommend the addon 'Paste', which I got after reading about it here. After tracking all the points in the 'Handy Notes' and 'Long Forgotten Hippogryph' addons, I had 4 and couldn't find the last one. I pasted the list you had and it led me to the missing one. I found 200 crystal sets so far, I realise only the most experienced crystal hunters could answer my question, but I'm gonna try: I did NOT find the crystal tucked in the cluster inside leyhollow cave, keep in mind, the other spot in that cave is one I still found lately, but NOT the one tucked in the cluster for months, and I do these 3-4 times a day. I have a feeling it's been removed, did anyone see any in that cluster in the last few months? If so, how long ago? It took me approximately 2 hours to get all five..
i was stuck for about 40 minutes on the 4th on and thought i might did something wrong. i ended up focusing on caves...and the 5th was in one..
Got this mount today on Ravenholdt on a trial character, was my first time searching for it. What I did was went through using the TomTom coordinates listed here found 1, then used coordinates posted by another user and found 3, then used this one again and found the last one I needed. They are all roughly the same areas but the slightly different coordinates help you see things you may otherwise miss. Good luck! I know this is a few years old, but wanted to help out with the coordinates. It has been posted that there are several crystals inside Oceanus Cove. The coordinates provided by players, however, require manual clearing. Since Oceanus Cove has its own map, the coords below will point them out properly, both on the minimap and main map, and also clear when you get close enough. I have listed what I believe are the original coordinates that used the main Azsuna map as it's base, so one can replace the originals with the ones directing to the Oceanus map.